I was deathly ill last week. I was fairly certain it was the summer plague or typhoid. I’m not sure. My guess was walking pneumonia, but I’ll admit I tend to be a bit dramatic on these issues sometimes. It started with a sore throat, some harmless coughing. Then, over the course of the next couple of days, it hit all the stages of grossness—stuffed up nose, phlegmatic cough, painful throat and ear canals and general miserableness. I moved downstairs to the couch (in an effort to save XFE from both catching my disease and losing sleep from my coughing). And during those many long nights and days alone ensconced in my couch, drenched in Vick’s Vap-O-Rub, drinking cup after cup of Throat Coat (ok, and a hot toddy or two) and hopped up on various cold medicines, I had a lot of time to think about life’s mysteries and how precious good health is, and most importantly, the state of our household magazine subscriptions. I’m at a three day work event where I’m sitting right next to my boss, elbow to elbow, in a basically subterranean bunker with practically no cell phone service. So no personal Twitter, no Web surfing for weird blog fodder, not even texting with XFE. This must be what solitary confinement is like. Oh, plus inspirational speaker after motivational speaker. And, I did not write anything for the blog this past weekend because I was busy not preparing for XFE coming home on Saturday evening. He specifically told me to pick something up for dinner. But I was so paralyzed by my potential to pick the wrong thing that I fell back into my default position: wait until XFE tells me what we should eat. This ineffective dining strategy earned me a well-deserved scolding. However, I did not really detect any element of surprise. But, I did buy the ingredients for a feast on Sunday night. XFE made homemade pasta with tomatoes, basil, garlic and lobster shrimp, which are, SHOCKINGLY, shrimp that taste just like lobster. I know, right? Crazy! Let’s hear it for science and genetically engineered seafood. There are no pictures because, well, I slurped it down way too fast. We’ve made this pasta dish before, but it had been a while. We had actually built up quite the appetite on Sunday….we went and looked at our first house. XFE has decided to dip a toe – potentially – into the housing market. This is, of course, fraught with anxiety and trepidation on my part. I’m pretty lazy and hesitant to change. But, we’re a team and I trust XFE. If he says it’s time to look into buying a house, then it’s time. We were influenced by this handsome devil. He has a website all about the DC housing industry called the Cribline. He’s become our real estate guru. In return, we buy him dinner once in a while. We had a dinner guest on Sunday (not our real estate guru, unfortunately). The topic turned to whether XFE and I consider ourselves “foodies.” Now, foodie is one of those terms I don’t think you can really self-proclaim. It seems a bit pretentious to say, “Why yes, Sir Grey Poupon, I am interested in the fine masterpieces of the culinary arts.” So we went through a checklist of endeavors that might indicate that one is a foodie. If you’ve driven seven hours to the edge of Virginia and Tennessee to eat at a restaurant headed by two young chefs that you read about at an inflight magazine, you might be a foodie. And, if you got genuinely upset when you discovered that said young chefs had left that restaurant before you’d had a chance to eat there again, you might be a foodie. If you own a Big Green Egg and consider it one of your most prized possessions, you might be a foodie. If you’ve roasted a 25-pound suckling pig on your brick patio, you might be a foodie. If your boyfriend owns a beginner molecular gastronomy kit, you might be a foodie. If you’ve spent an entire day (6.5 hours to be exact) making Rick Bayless’ mole (Project Mole 2009), which required about 26 ingredients gathered from eight different stores and four pages of instructions, you might be a foodie. Ditto on barbecue sauce. Actually, anything at all related to barbecue. Double points if you’re best friends with your butcher and ask him not only for fine meat products, but also vacation tips. If you, while in the throws of a 10-day bout of food poisoning during a vacation in Northern Italy, insist on honoring your lunch reservation at a three Michelin star restaurant for the 12-course tasting menu, even though the price of said lunch is about the same as a hand woven Turkish rug and you go to the bathroom and throw up after every other course, but still insist on tasting everything, you might be a foodie. And, it goes without saying, you might be insane. If the majority of your souvenirs from overseas trips are food-related (ie: ceviz walnuts and sahlep from Turkey; Thai curry and dried lime basil from Bangkok; mustard from Paris; smoked paprika from Spain; wine from Australia. And Italy), you might be a foodie. If you sweat each time you go near Customs because you’re genuinely concerned not that you will get caught with the food items and have to pay the fine, but instead it will get confiscated and you’ll never get to enjoy the item, you might be a foodie. If a chef’s kitchen and a place to store your Big Green Egg and gigantic grill and wine fridge are considered non-negotiable criteria in your house-hunting efforts, you might be a foodie. Or, at least a kitchen with the potential to be turned into XFE’s Stadium Kitchen Headquarters. So, are we foodies? I don’t know. But we’re definitely crazy. And it tastes so, so good. 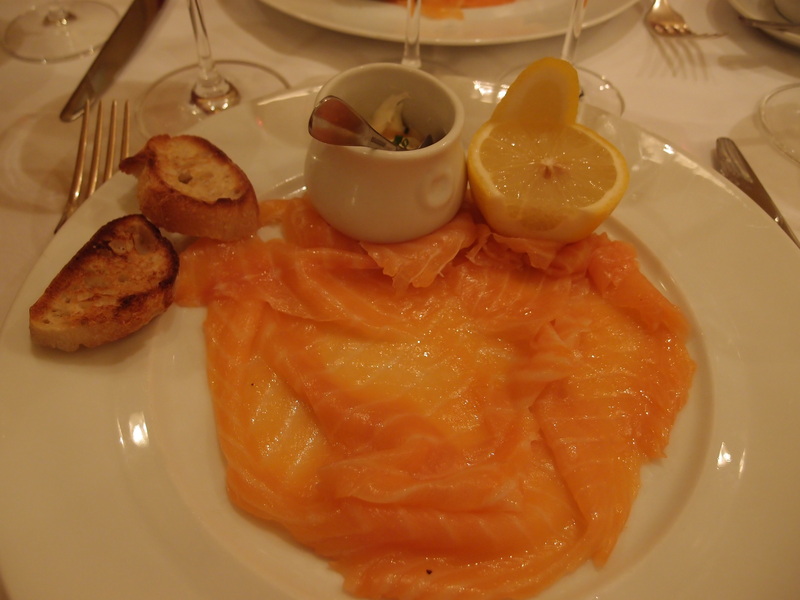 One of the things I was most looking forward to on our Paris trip was eating. Let me rephrase that slightly, one of the things I most look forward to anytime I take a trip is eating. But in Paris, this was especially the case. It’s just such a foodie town. And this trip was my do-over. The last time I was in Paris was when I was a poor college student, so my diet consisted mainly of baguettes with butter, cheese bought at the grocery store, and pastries. I’m even ashamed to admit there might have been a Le Big Mac in the lineup at some point. Not the most varied or sophisticated fare. Plus, I was fresh out of the trailer parks of West Texas and totally ignorant. Basically, I didn’t know where to go or what to eat. And remember, (since I’m old as dirt) this was pre-Chowhound-TripAdvisor-Yelp days. No guidance what’s-so-ever. XFE was last in Paris as a high school student, so who knows what he even ate. Actually, I do know, because on day three of our trip, we spent an inordinate amount of time tracking down steamed mussels, which he remembered fondly from his high school adventure abroad. This time, we both put a lot of thought and research into what we would be eating. Our efforts were a bit thwarted by the fact that we only booked our trip a week before getting there, so reservations were a bit difficult to come by. But we got off the plane with stomachs rumbling and raring to go. After dumping our stuff at Le Meridien Etoile, we headed over to grab lunch at Auberge de la Reine Blanche on the Ile de St. Louis, an absolutely charming neighborhood close to Notre Dame and the Latin Quarter. It’s an adorable tiny French restaurant, with exposed wooden beams, tiny wooden tables with cane and thrush chairs, a large round wooden bar that reached to the ceiling, and walls covered with dollhouse furniture. Very odd, but somehow, also quaint. The onion soup was AMAZING as was my main course of some kind of fish, very simply prepared with wonderful fresh herbs. XFE started with (and luckily shared) the most incredible oysters served with a light mignonette sauce. They were large and meaty and salty and just awesome. XFE’s steak with Roquefort sauce was also very, very good if a bit rare for my taste. The house Bordeaux was excellent. It was all very good and very affordable. The service was, well, very French, but no biggie. 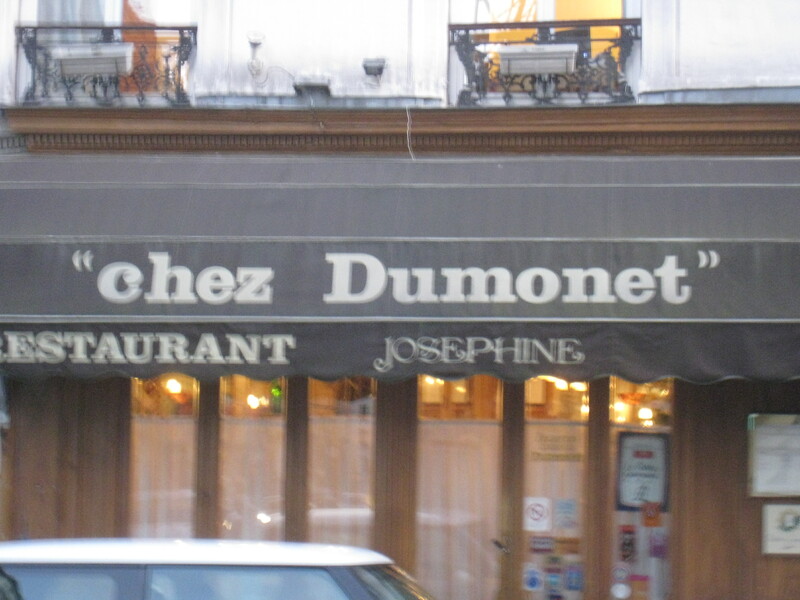 Later that night, we ate at Josephine “Chez Dumonet” in the Luxembourg neighborhood. This was a place I had called on my own for a reservation. They’re not open on Saturday or Sunday (I was informed), and they were fully booked for that Friday. However, our concierge at Le Meridien Etoile was able to get us a reservation at 7:30. We showed up a few minutes early and were chased away. Apparently, 7:30 MEANS 7:30. No drinking at the bar while waiting for your reservation. We slunked away to a bar on the corner and had 2 euro Bordeaux standing at the bar. At our appointed time, we dared to enter Chez Dumonet again. We were taken immediately to our seats at the back of the narrow restaurant, near the kitchen. I never mind sitting near a kitchen and this one was no exception. I was transfixed as the staff cooked and foil wrapped a huge haunch of meat for a customer who showed up later in the evening to pick it up and take it away. The whole ambiance of the place was typical old Parisian bistro, nothing fancy, just pure efficiency and great food. I honestly don’t remember much about the décor, but the atmosphere was just perfect. We started with champagne and an amuse bouche of some cream soup with a drizzle of truffle oil. The bread and butter were, of course, excellent. And then there was the smoked salmon appetizer. Yu. Um. Melted on the tongue. I had the duck confit which was probably the best I’ve ever had. The skin was so crispy and the potatoes were perfect and garlicky. XFE ordered the chateaubriand, which we both thought, for some reason, would be wrapped in pastry, but we were, of course, wrong. I’m afraid we had our Wellington mixed up with our chateaubriand. What can I say? It had been a long travel day. So, for a second time that day, XFE had steak, this time with béarnaise sauce. He didn’t seem to mind. We finished with a shared Grand Marnier soufflé, which was a work of art. Eggy, boozy, and perfectly browned, it towered over the ramekin, but miraculously, it held its shape even when we sunk our spoons into it. Pretty amazing stuff. A woman at a nearby table even applauded when it came out (since we were among the first diners, our dessert was one of the first out of the kitchen.) They also brought us two tiny, thimble-sized glasses of Grand Marnier to accompany the souffle, a very nice touch, I thought. The service, the food, everything was just perfect. Not a bad way to end the first day in Paris.